The chilaquiles are such a popular preparation in the Mexican homes, that each mother has its own way of preparing them. In this chilaquiles dish, the way we are going to prepare them, won’t consist only of tortillas bathed with salsa and garnished with many ingredients – we’ll go further by adding chicken to have a very nutritious plate, which will charge you of energy at breakfast time. This dish can be accompanied with: refried beans , guacamole , green rice , quesadillas or any appetizer that you like. To prepare the chilaquiles there are many steps to follow but to make things easier, all this is divided into stages. We recommend making the chilaquiles with old tortillas because they acquire a better consistency when they are fried. Since the tortillas are fried to make the chilaquiles, a vegetable oil must be used because the olive oil is not good for frying dough. To make the chilaquiles epazote is used. Really try to get this herb because it gives a sensational flavor to the chilaquiles. Clean 1/2 chicken breast and put it in a saucepan. The enough Water to cover the chicken breast. Take from the saucepan the chicken breast with the kitchen spoon, wait until it cools a little and shred it; then set aside. 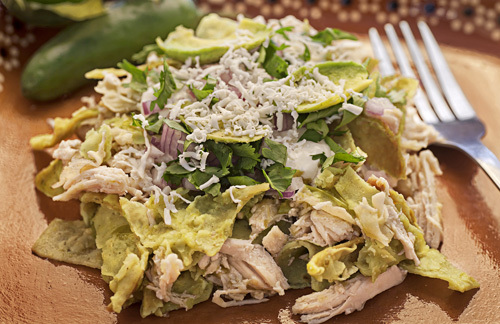 Incorporate in the saucepan the chicken that was shredded, mix the ingredients and cook the green chilaquiles with chicken for about 3 minutes, until the salsa has a very thick consistency; stir occasionally. Then set aside. Finely chop 1/4 of an onion (1.3 oz) and 1 coriander sprig; then set aside. Recommendation: Accompany your chilaquiles with bread. Variation: Let’s change color to red. Did you like the Chilaquiles with Chicken? ➔ Prepare a delicious Bean Soup. ➔ If you prefer an antojito a Mexican Rice. ➔ If you only want a side dish, prepare a Zucchini with Corn Salad. Use the “CDN Kitchen Thermometer" and you will always know to perfection the temperature of your food. If you also want to know the exact food’s weight so your recipes will come out perfect... there’s no better option than using the “EatSmart Precision Pro Kitchen Scale". Use the “Cuisinart Saucepan" to make your chilaquiles. This saucepan is very resistant as it is made of stainless steel, it distributes very well the heat and it is easy to clean – your chilaquiles will be perfect.